Learn how to drive alignment, performance, focus, and engagement with OKRs. Use this guide to set up your organization's Gtmhub account. In this guide, we will show you how to do this by using Gtmhub. The first thing you need to do is to decide the OKR cycle of the company. Before doing so, you should keep in mind that companies typically plan OKRs in quarters (3-month periods). However, it’s not uncommon for smaller and larger companies to use shorter (1 or 2 months) and longer (6 to 12) periods of time, respectively. 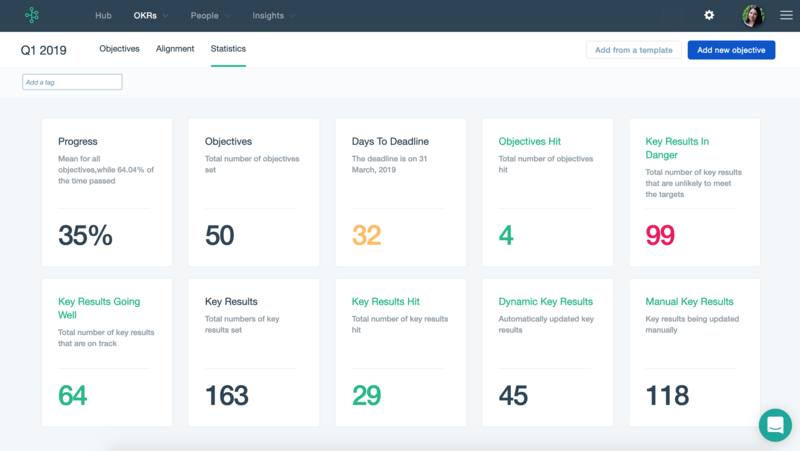 After doing this, you’re ready to start driving your organization towards improving the alignment, performance focus, and productivity parameters. You can learn more about OKR sessions in this article. Goal: Set top-level objectives so that your teammates can align their objectives with the company ones. Short description: Last quarter we've improved our sales process and closing rates, so to deliver on our targets we now need to focus on top of the funnel. Congratulations! You've just shared your top-level objective with everyone in the company. This is the first step towards achieving alignment in your organization. To learn more about defining your OKRs, we recommend reading the following blog post: Anatomy of an OKR: How to set your OKRs. Now, let's invite some of the teammates to Gtmhub. After all, one cannot align with oneself. After inviting your team members to join Gtmhub, you can then start defining objectives for them. For better illustrating purposes, the top-level objective that we just created in the previous step will also be used in the following example. There are three ways of setting OKRs in an organization: top-down, bottom-up and negotiation. Even though we recommend negotiation as being the best approach, in this case we will use a top-down approach for the sake of simplicity. By aligning this objective with the top-level objective of Increasing demand, we have started to achieve an alignment within our organization. In order to define the goals and strategy for the current period, we should repeat this process right from the start. 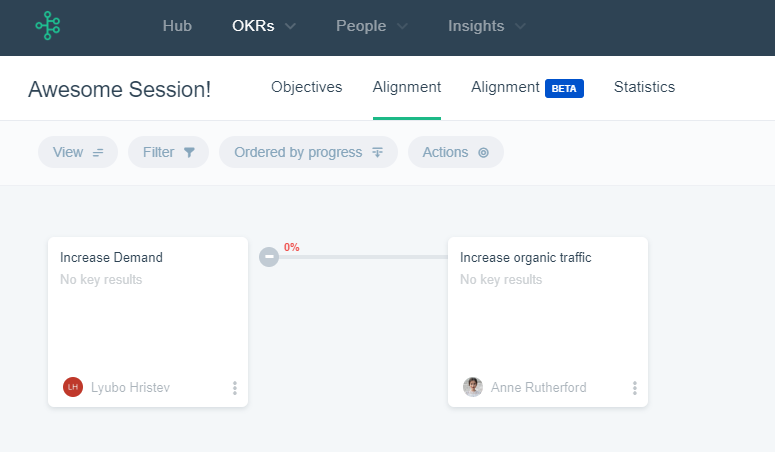 You can navigate to the Alignment subsection under the OKRs screen view to see visual representation of objectives within your organization. Goal: Define key results that will allow us to track and improve performance against our objectives. Once we have defined the objectives, we can now start defining key results which are effectively success metrics. Typically, best practices point out that every objective should have 2-4 key results defined. To learn more about choosing key results for your objectives, you can read the Anatomy of an OKR: How to set your OKRs blog post. Attaching quantitative key results to objectives defines the tactics behind achieving objectives but also gives everyone an insight how well is the organization performing. As your organization grows, the OKRs > Statistics view will become indispensable as it shows aggregated performance of all the OKRs in the given session. Goal: Make sure everyone is focused on what's important and that OKRs won't become a laundry list of things that would be nice to do. OKRs are as much about what will not be done as they are about what will be done. When just starting out, many organizations fall a pray to defining too many objectives. Gtmhub helps you manage this process by limiting the number of objectives a person can have in any given session as well as number of key results any given objective can have. OKRs best practices recommend that there are up to 3 objectives per person and up to 4 key results per objective. However, in practice, we have found out that organizations that start with more limited approach of 1 objective per user and 3 key results per objective are more successful in adopting OKRs. By limiting the number of objectives any given person can have, we enforce radical focus within our organization. Goal: Celebrate every victory, give credit where it's due, and advice where needed. People are engaged when they have a purpose and when their contributions are being recognized. As companies grow, this simple fact can often be overlooked. OKRs and Gtmhub, however, help you keep this essential part of the culture as you scale. First, through transparency and alignment of the objectives, it’s easy for every team member to know what is going on and how she contributes to the mission. Secondly, Gtmhub provides an easy way for everyone to give feedback and praise. In this definitive guide, we have demonstrated how OKRs and Gtmhub can help you drive alignment, performance, focus, and engagement throughout your entire organization. Gtmhub has been engineered for achieving an overwhelming simplicity and lowering the barriers for OKRs adoption. To learn more about the sophisticated features of Gtmhub, browse our documentation portal or schedule a demo.